The courthouse was built in stages. 1884-1909 appears over the arched entrances. Walk right up to the front doors and observe the stone birds, serpents and rodent amongst the sculpted leaves. The courthouse is open to the public on weekdays 8.30 to 5.00. Romanesque Revival architecture. Located on the corner of Main and Maple St, Woodstock. 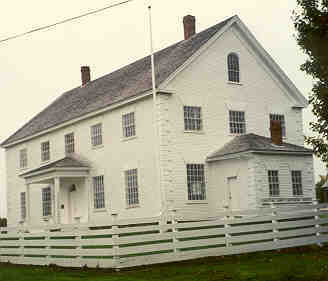 In Upper Woodstock is the old county court house built in 1833. 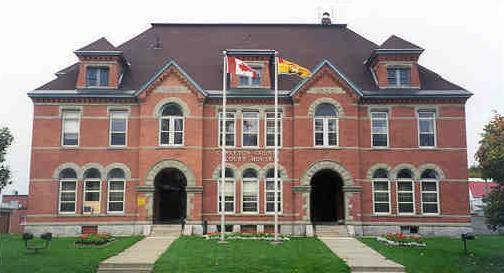 It is owned and operated by the Carleton County Historic Society is opened daily to the public with guided tours in July and August. A Parks Canada Historic site, restoration work commenced in 1960 on this Georgian structure. Displays include historical paintings, sketches photographs needlework etc. On route 560.